To help highlight this wonderful collection and amazing charity, selected bloggers have been set a challenge to see what's in their Enma Bridgewater bag - and I'm one of the lucky bloggers! 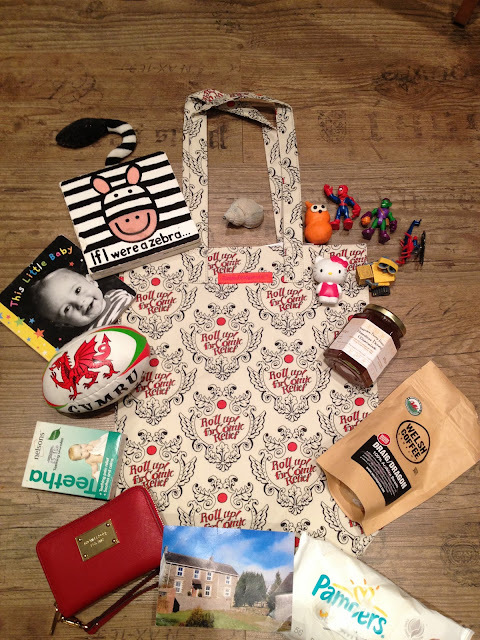 My bag is full of things from our recent short break to Wales - we have family in Llanelli so visit throughout the year and this time we stayed in the most beautiful old farm house - Llwydcoed Fach. Most importantly, a beautiful shell which my 3 year old boy found on the beach in Pembrey for me. I love it and its a lovely find, for him he said it was a Spider-Man phone and he could hear the sea in it!!! A collection of super heroes and small toys. You can find a small collection like this in most of my bags! In fact, some I have even made out of fimo! Both my little children relish a chance to raid the toy stash in my bags and they always come in handy - especially if we are away - These little nuggets of bright plastic (and fimo) are a godsend on car journeys, waiting for food in restaurants or trying to have conversations with people you haven't seen in a year! Teething powder - my youngest is really suffering and we've found that these have helped calm both our children when they have been going through particularly painful patches - Meg will actually point these out when she wants one! A Postcard. This one is from the farmhouse we stayed at in Wales and my little boy loves to look at the postcard and talk about our holiday - he refers to the farmhouse as "our cottage" if only that was true - the place is Laura Ashley heaven! There were some really delicious Welsh waffle biscuits in here, but they've all been eaten already! Sorry *blush* thing is, I've given up chocolate (and veggie sausages) for lent so anything even remotely sweet and chocolate free gets hoovered up by my big mouth! A pot of jam! well, this isn't any old jam! This is Brynderi shredless honey marmalade - I'd never even heard of this combo before and I'm not really a big honey fan, in this case though, I am! and we all enjoy this on our toast! yum! A squashy mini Welsh rugby ball featuring the red Welsh dragon who Blake calls him Mr Comree! Books, We always seem to have books with us and we can never have too many! Nappy wipes - well I think these are in every bag every mum in the country owns! My fancy all singing all dancing purse. This was a Christmas present from my lovely hubby and it's extra clever because the middle compartment is designed specifically to hold your iphone... oh and its a Michael Kors! Lucky me! However it's humbling to remember that not everyone is lucky - hence Comic Relief and yep! I will be dipping into my posh purse for this very worthy cause.